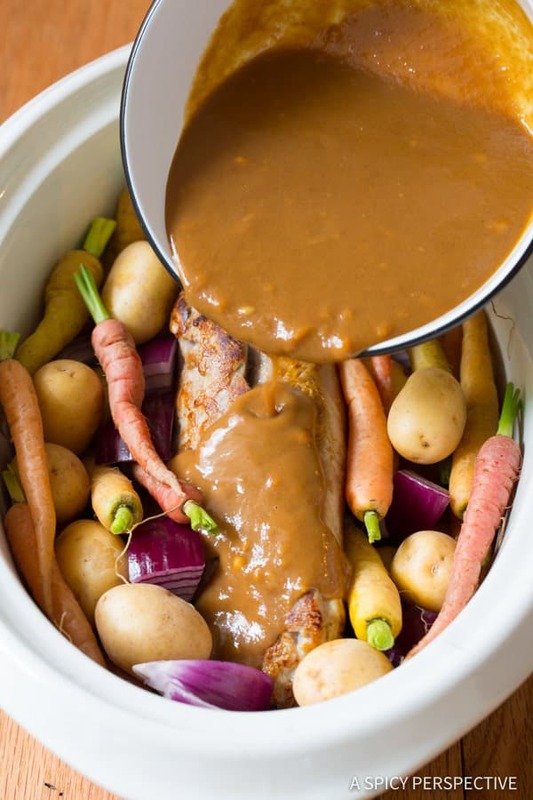 Simple Crock Pot Pork Tenderloin with Vegetables, bathed in a rich tangy gravy. A perfect family meal any day of the week! 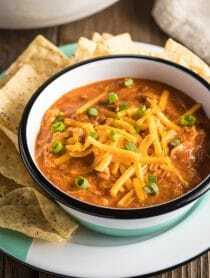 I never get tired of simple crock pot meals. Especially those that are healthy, yet cozy and inviting. We eat a lot of chicken and fish in our house, with the occasional grilled steak on the weekend. Yet one protein I feel often gets sadly overlooked, is good ol’ pork. In the summer I tend to grill whole pork tenderloin and serve it with salad. However, the rest of the year I almost forget it exists. What a shame. I’m trying to remedy the pork-less rut this spring, by cooking some of my favorite pork laden comfort foods. 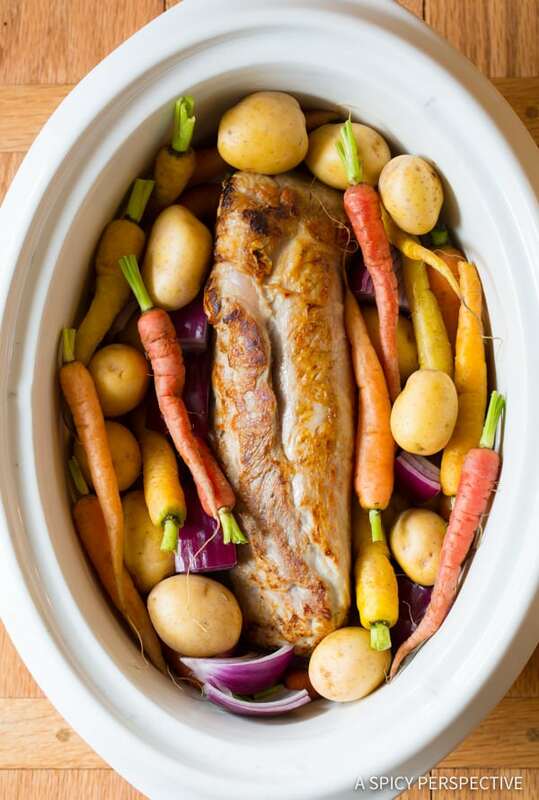 Crock Pot Pork Tenderloin with Vegetables is an old classic I’ve made for years, just not as often as I would like. It’s extremely simple to make, with just one whole pork tenderloin, a few veggies, and a simple pour-over sauce that turns into a rich savory-sweet gravy while cooking. What’s not to love? 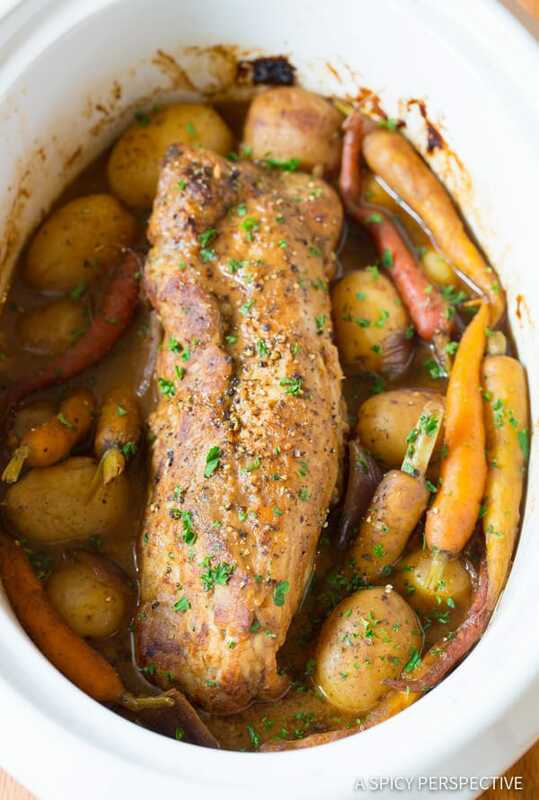 To make Crock Pot Pork Tenderloin with Vegetables, sear a large pork loin in a skillet to seal in the juices and create a crust. 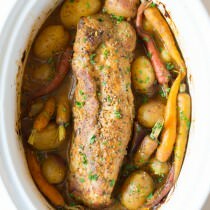 Then load up a 6 quart slow cooker with chopped onions, baby new potatoes, and baby carrots… And the pork tenderloin. 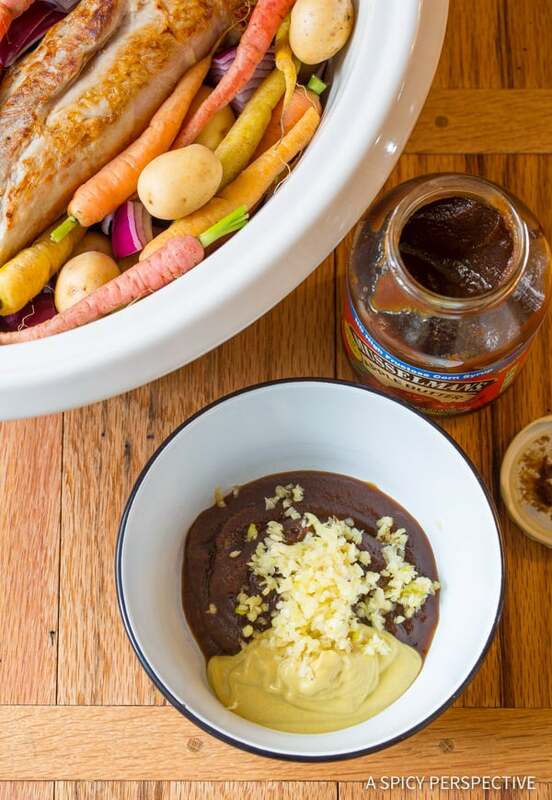 Whisk together minced garlic, dijon mustard, soy sauce, beef broth, and a surprise ingredient, Musselman’s Apple Butter for a thick zesty sauce with a touch of sweetness. I love sneaking apple butter into unexpected places. 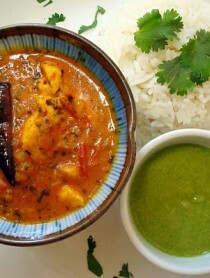 It provided depth and richness, that turned an ordinary recipe into something special. Cover the crock pot and let it simmer for several hours. You’ll know when it’s done, when the potatoes are fork-tender. Although they sound alike Pork Loin and Pork Tenderloin come from different parts of a the pig. A pork loin is larger and often tougher cut of meat that usually needs to be cooked for a much longer period of time. However pork tenderloin is long and narrow, so it cooks much faster than pork loin. It’s great for grilling! Yet make sure not to over cook it because it dries out quickly. Fortunately, in this recipe the crock pot makes it possible to use either pork tenderloin or pork loin. 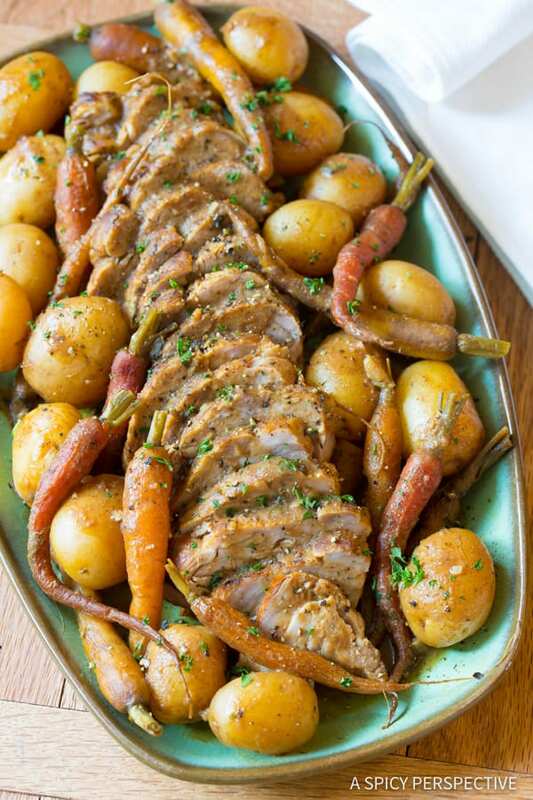 This Crock Pot Pork Tenderloin with Vegetables recipe is a true crowd-pleaser. It’s a sure-bet with the most stark meat-and-potato eaters, and fills the kitchen with a marvelous aroma that wafts over you as you walk in the door after a long day. 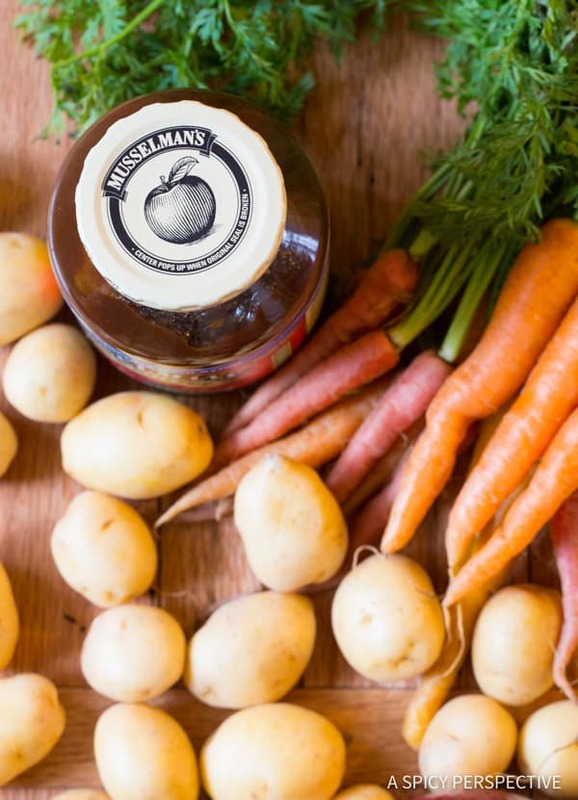 Musselman’s Apple Butter is now made without High Fructose Corn Syrup. Look for more sweet and savory apple-icious recipes here! 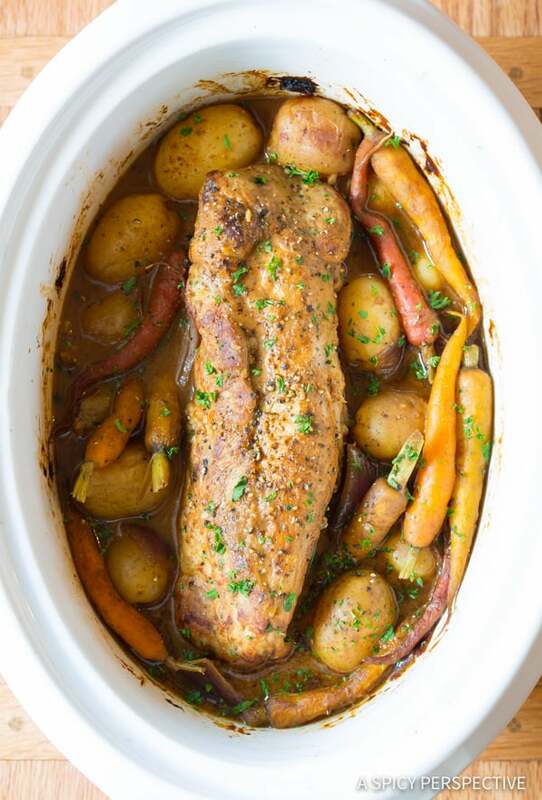 Crock Pot Pork Tenderloin with Vegetables – an easy slow cooker pork loin recipe with potatoes, carrots, onions, and herbs in a rich tangy gravy. 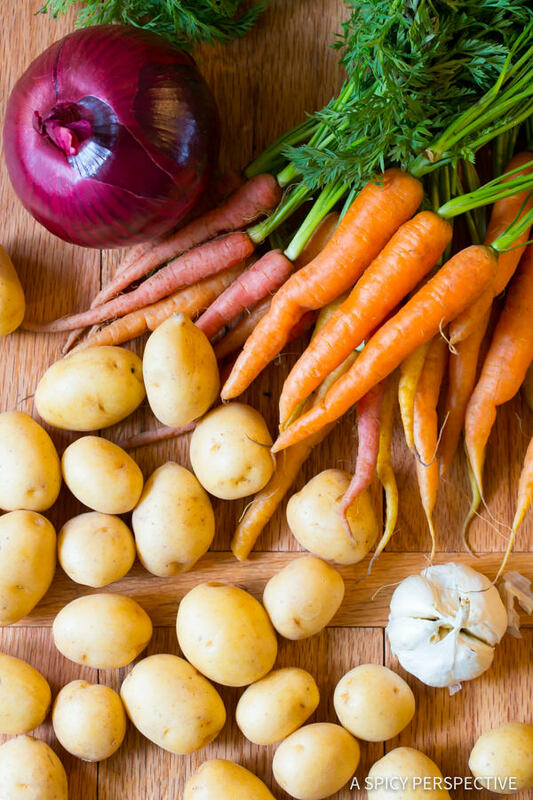 Cover the bottom of a large 6 quart crock pot with the chopped onions, baby potatoes, and carrots. 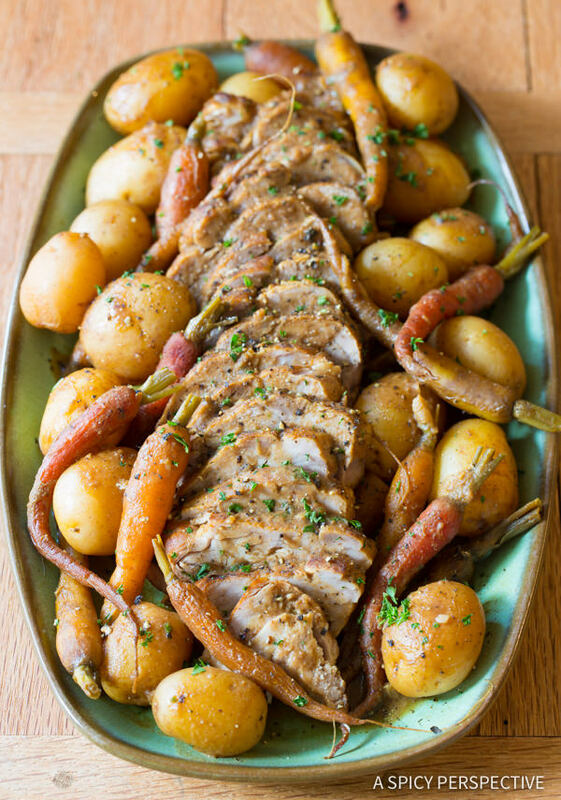 Lay the seared pork loin over the top and surround it with the remaining vegetables. In a small bowl, whisk the minced garlic, Musselman’s Apple Butter, dijon mustard, soy sauce, and broth together. Pour the mixture over the pork and vegetables. Cover the crock pot and turn on low for 6-8 hours, or high for 2-4 hours. Once the potatoes are tender, dinner is ready. Cut the tenderloin into thin slices and place on a platter, surrounded by vegetables. Taste the gravy, and season with salt and pepper as needed. Then pour the gravy over the pork and serve. If you want to use a thicker pork loin, instead of tenderloin, cook on low for 10-12 hours, or on high for 5-6 hours. Disclosure: This post is sponsored by Musselman’s Apple Butter. All opinions are my own. Will it mess it up if I don’t sear it first? Searing the pork loin helps lock in the juices and also give the exterior an appealing appearance. You do not have to sear if first, but it will definitely look and taste better if you do. Made this recipe & it was delicious! I didn’t have any apple butter, so I substituted with Maple/Pumpkin butter instead..OMG! Out of this world! The photo clearly shows a pork tenderloin which is what I just put into my crockpot. Is it supposed to be a pork LOIN which is much shorter. And I seared it all sides as the recipe called for. Have I just botched my recipe? The recipe calls for pork loin, but the photo looks like tenderloin to me. A 1.5-2 lb. loin would be much shorter. Curious, because the two cuts of meat cook quite differently. My dad wants a recipe to make pork loin in his crock pot. This looks great but he doesn’t have access to Apple Butter. Suggestion? There are ways to make apple butter at home. You can find tons of recipes for home-made apple butter online. This sounds so Good! Would it work the same with two smaller pork loins? I would love to make it this week with the loins that I have on hand! Currently have this in my crock pot while I am at work! Can’t wait to try it, it was super simple to put together! Hi! 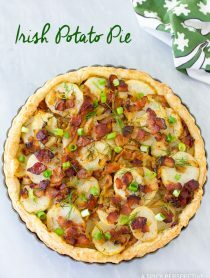 I’m super excited to try this recipe this week! I did have one question, and it may be a dumb question, but in the beginning when you are wearing the pork loin, is it searing the pork loin 8-10 total or 8-10 minutes on each side? Sear for 8-10 minutes total, about 2-3 minutes per side. This was really good and easy!! Could you do this without beef broth or with chicken broth instead? What could you use instead of mustard? I love it when the crockpot can do all the work! Wow! That sauce is awesome. Did you know that pork is the most eaten meat in France? Beats chicken, fish, been and lamb.